We see now the description of the “properties” of objects. For “object properties” is mean the color, linetype, thickness of lines drawn on AutoCAD, and ending with the Layers. You can operate the controls on these factors through the drop-down menu, on the “Ribbon”, the “properties toolbar” and “layer toolbar”, or via the “properties” tool and its window. 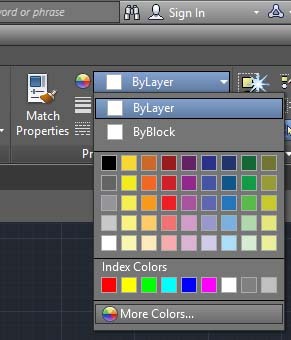 Autocad has a palette of 255 colors that can be assigned individually to each line we create. Draw a random line on the screen and select it with the mouse clicking on them, the line will be highlighted. Once selected, click on the first area of the “properties toolbar” to open the Color-control drop-down menu. …Plus the first seven main colors that AutoCAD provides us, finally, the last item which when clicked will open the full palette of colors available... but we will see shortly. If you now select one of the colors on this drop-down, such as the red, line that we selected will change color. If we still click the drop-down and select thecolorgreen, the line will turn this color. We can change its color until it is selected. Pressing the “Esc” key on the keyboard, the line is clear and colors of the menu returns the “BYLAYER”. This means that the next line you create will have the color setting BYLAYER. If you act now on the pop colors, while no line is selected, and choose yellow, we will ensure that the objects we designs from here on, will be this color. We can then set a base color of our choice with which to draw and if necessary, we can change color to one or more objects at once, as we have just seen, after being select. Color management through the “Ribbon”, is similar to that described above, with a greater choice of colors, here the "index colors" are the main. In this window, we find the full colors palette of AutoCAD, that we can select with the mouse and then click OK to assign to objects. 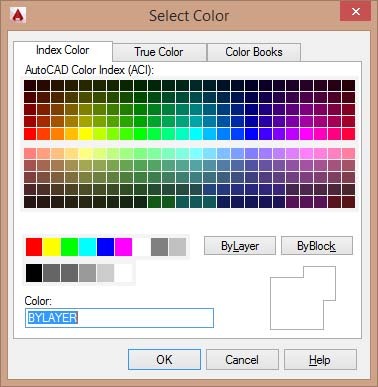 As you will see on this window, each color corresponds to a number, except the first seven of which also gives AutoCAD the color name. (Red, yellow, green, cyan, blue, magenta, white).